This is a glorious glass mosaic by Kevin Pawlowski. 13 months in the making, over 6,500 ties were hand applied to a 4’w x 5’h structure. The reproduction was created by the artist to best display on a rectangle design. The background is filled with the same cobalt mosaic tiles that wrap the sides of the original. 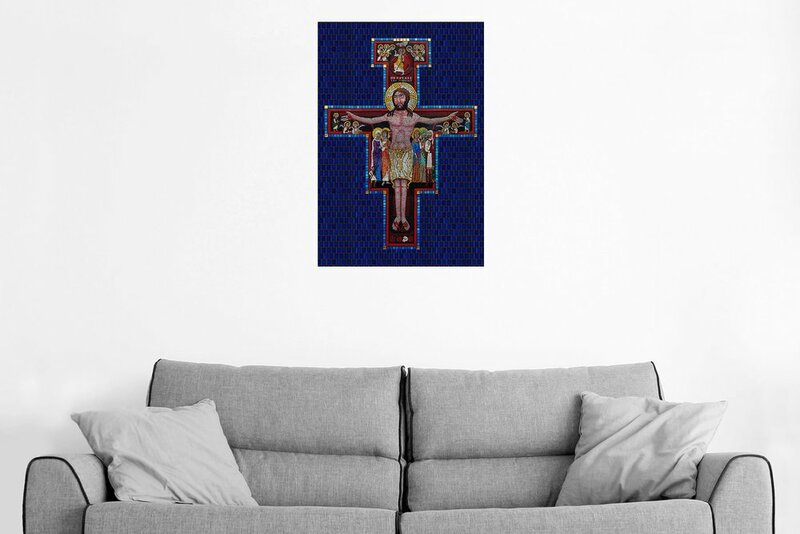 The design is based on the original San Damiano Crucifix hanging in the Basilica of Saint Clare in Assisi, Italy, but with a Latin American twist. Turquoise, blue and red elements were added, which were inspired by Latin American folk art. This is a node to Pope Francis, combining the roots of St. Francis with the South American background of the Pope. It is more commonly called the San Damiano “Cross”, but it is technically a crucifix because of the representation of Jesus hanging on it. The original is a large Romanesque rood cross that St. Francis of Assisi found in a dilapidated church in the thirteenth century. While he was praying, the Lord spoke to him and gave him the commission to rebuild the Church. It now hangs in the Basilica of Saint Clare in Assisi, Italy, with a replica in its original position in the church of San Damiano nearby. Franciscans cherish this cross as the symbol of their mission from God. The cross is a crucifix of a type sometimes called an icon cross because in addition to the main figure of the Christ, it contains images of other saints and people related to the incident of Christ's crucifixion. The tradition of such painted crucifixes began in the Eastern Church and possibly reached Italy via Montenegro and Croatia. Purchase a canvas art print, poster, and even a coffee mug. Posters are printed in high fidelity color and glare-free matte paper stock. Framing is not available for posters. The 11 ounce white ceramic mug is printed with a high fidelity dye sublimation process. Canvas reproductions are stretched over a 3/4" frame and has a wrap-around edge, which looks great hung with or without a frame.